The image at right is one of a series called “Pulps” by San Francisco artist Katie Gilmartin. 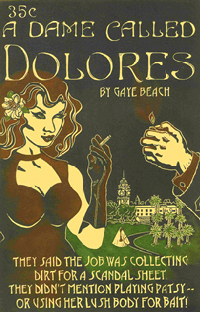 It is titled “A Dame Called Dolores” and I hope you will click the image to go to Katie’s site where you can see a larger copy and get a better look at the amazing craftsmanship. Considerable information about Katie is already available on the Web, including descriptions of the process she employs to create her images. So I’ll mention just a couple of things I find jaw-droppingly astounding about her technique, then offer some thoughts about this particular image.